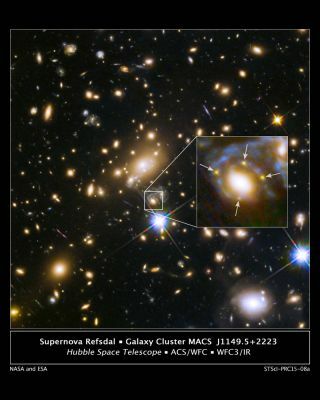 The Hubble Space Telescope image reveals four images of the same supernova. The photos were created with the help of a galaxy that "gravitationally lensed" the supernova so it could be seen clearly from Earth. Astronomers using the Hubble Space Telescope have captured four images of a supernova explosion in deep space thanks to a galaxy located between Earth and the massive star explosion. You can see how Hubble saw the supernova in this NASA video. The galaxy cluster warped the fabric of space and time around it — like a bowling ball placed on a bed sheet — allowing scientists to see the supernova in four images. When a strongly lensed object occupies a large patch of space — for instance, if it's a galaxy — it can get smeared into an "Einstein ring" surrounding a gravitationally lensing mass. However, strong lensing of small, pointlike items — for instance, super-bright objects known as quasars — often produces multiple images surrounding the gravitationally lensing mass, resulting in a so-called "Einstein cross."